Senior population is expected to grow to more than 2 billion people by 2050. Aging society means gains for companies focused on seniors: healthcare and insurance sectors are expected to benefit in particular. The population aging is a global fact. It will strongly influence markets and economies posing both investing challenges and opportunities. Fertility rates have been declining for decades and we are already below the population replacement level of 2.1 in many countries. 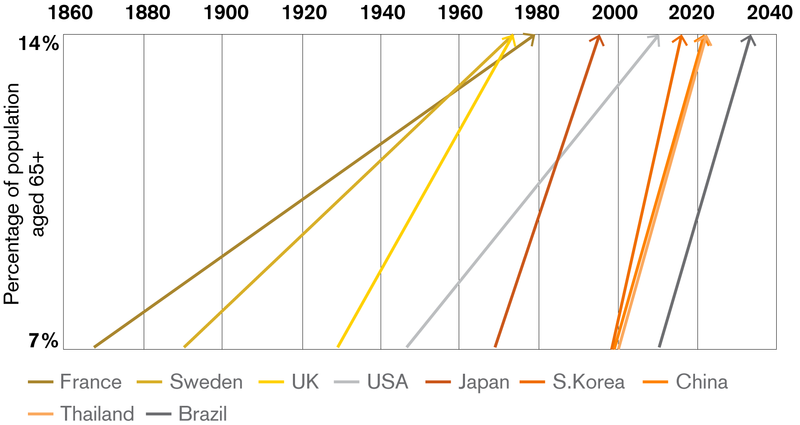 The median age worldwide will be 36.1 years in 2050 compared to 29.6 today. Life expectancy will increase by one year every five years. Six of 10 women and slightly over 5 of 10 men born between 2000 and 2005 can be expected to live until 80. While today there are 7 workers for 1 elder person, in 2030 there will be only 4.9 workers. Already, 48 percent of today's retired population does not receive any pension. 80 percent of older people have at least one chronic disease and an estimated 75 percent of healthcare spending is on the elderly. By 2020, the spending power of 60+ people will reach an estimated 15 trillion dollars. Clearly, aging will be a powerful societal and economic driver that will re-set consumer markets, as well as transform healthcare and property markets. It will also pose major funding challenges, bringing private funding products to a new level as government-funded old age programs will not be sufficient. The steeper the line, the more rapid is population aging. Seniors are the fastest-growing consumer age group around the world. They have an increasingly high spending power, especially in the developed world. For example, in the USA, of those with annual earnings of above 200,000 dollars, 60 percent consists of boomers (aged 50+), and their average household wealth is over three times that of people in the age group of 25-50. Further, the boomers already represent more than a half of developed market consumer spending. Since the elderly have different needs, priorities and spending patterns compared to younger groups, the implications for manufacturers and retailers could be substantial. Keeping in mind aspects like lower mobility of seniors, health issues, but also their will to remain active and attractive raises chances for gains for retailers, tourist operators, fitness and beauty companies, as well as diet supplements manufacturers. Although there is a general agreement on the trends unfolding in aging, we are ill-equipped to grasp its magnitude in terms of the shift in societal composition, given the acceleration in the aging trajectory. We expect the addition of more than a billion seniors by to pose immense challenges, but also present opportunities. In our view, investors positioned along the continuum of seniors want and need are likely to witness attractive returns. In the next article on Silver Economy we will have a detailed look on housing and healthcare thus providing investment suggestions.